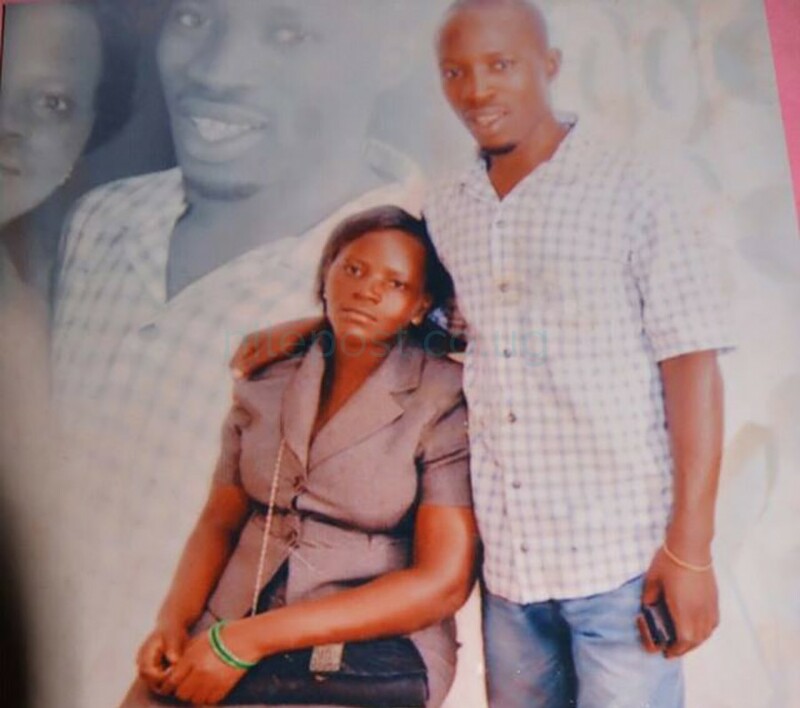 To Moses Nyakana, his wife and mother of five, Juliet Nakiyimba,31 had left their home in Kigagga zone in Makindye to attend to her sick parents but the story changed a month later when he was informed his wife was seriously sick and needed to be repatriated from Jordan. Questions started lingering in Nyakana’s mind because he didn’t know how the wife who had gone to take care of her parents had ended up in Jordan, which is many miles away from their marital home in Makindye. 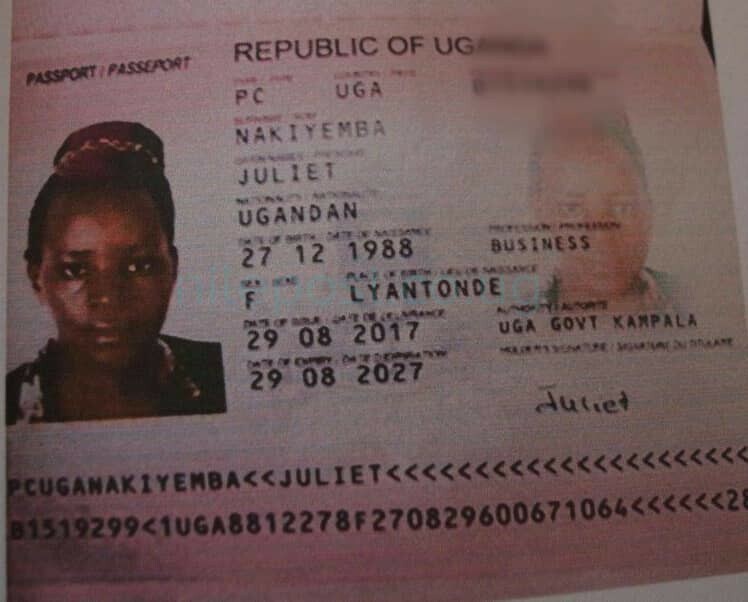 Fast forward, Katwe police station have arrested to people before slapping human trafficking charges on them for maiming Nakiyimba to death while in Jordan before her body was repatriated to Uganda last month. According to the Kampala Metropolitan Area police spokesperson Luke Owoyesigyire, Muhammed Musoke and Timothy Wakhasa were arrested on Wednesday following an investigation by police indicated that they had been involved in the crime. “Nyakana told our investigators that the deceased left his home to go to the village to visit her sick parent. The unsuspecting husband would later call to establish whether she had reached safely but he attempts to reach Nakiyimba were futile because his number had been blacklisted,”Owoyesigyire said. 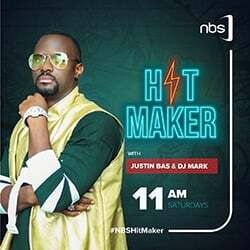 It is alleged that Nyakana would after a few weeks be sent voice notes and whats app messages by Nakiyimba to confirm to him that she had flown out of the country and that she had reached abroad safely for greener pastures. According to Nyakana, things changed when he received a call in September from an unknown person informing him that his wife was very ill and was to be repatriated back, a call he never took serious because she had spent barely a month. “He was then called the second time by another anonymous person who told him that the deceased was mentally ill and had committed suicide by jumping through a window of a five storied building,”Owoyesigyire said. It is then that Nyakana reported the matter to police in a bid to establish the name of the company through which his wife was flown abroad. It was established that Nakiyimba had been trafficked to Jordan in August through Rwanda by Al Saudi Agency, located along Salaama road. 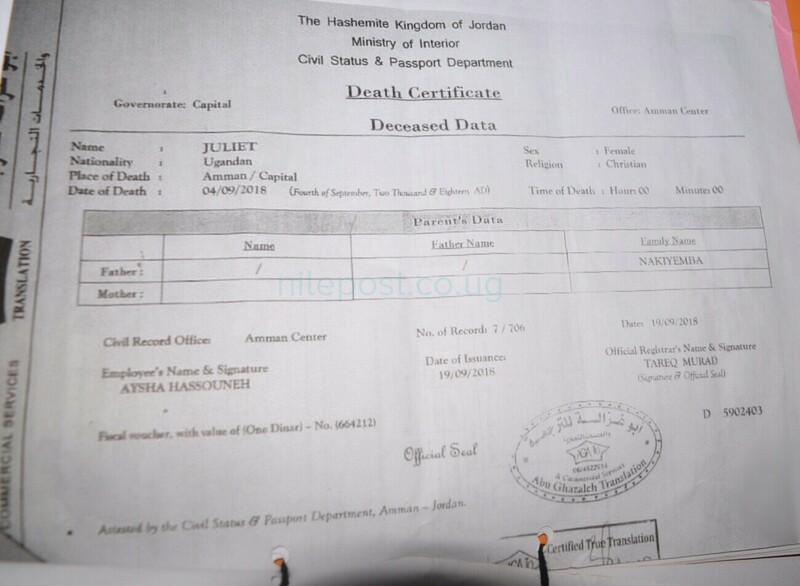 According to the death certificate issued by Jordan’s ministry of interior, Civil Status and Passport, Nakiyimba died on September, 4, 2018 in the capital Amman before her body was repatriated on September 24. “The post mortem reports confirmed that two of the deceased’s kidneys had been removed a condition that may have resulted into her sudden death,” the police mouthpiece said. Last month, Kenyan security operatives busted a suspected human trafficking racket arresting 71 people trafficked from Uganda most of whom claiming to be on their way to Oman. Of the 71 people arrested, 59 were Ugandans who had entered Kenya with fake entry stamps in their passports. On all occasions, the trafficking is done in syndicates between local agents, conduit country (especially Kenya) and the destinations especially Middle East countries. Agents from destination countries pay for recruitment ,transportation, travel documents and hiding places along the way before their ‘goods’ reach the desired destination. Agents abroad spot the jobs and those in Uganda do the recruitment through opening up Facebook accounts and running google adverts to hook desperate clients. On many occasions, the victims don’t have information about the kind of ‘jobs’ they are to be offered while in Middle East but because of being desperate, they accept to be flown abroad for ‘work’. On reaching to Middle East countries, the lucky are offered jobs that mainly include being house maids but are overworked, underpaid and also sexually harassed and most of them end up committing suicide. Meanwhile, the unlucky ones like Nakiyimba end up being sold for their internal organs like kidneys and liver among others to be removed. The annual crime report released recently indicated that crimes related to trafficking of persons had increased by 41.6 percent from 125 registered in 2016 to 177 cases reported to police in 2017. These numbers however don’t include cases of human trafficking not reported to police but actually happened. According to police, over 50 people are trafficked from Uganda every day.